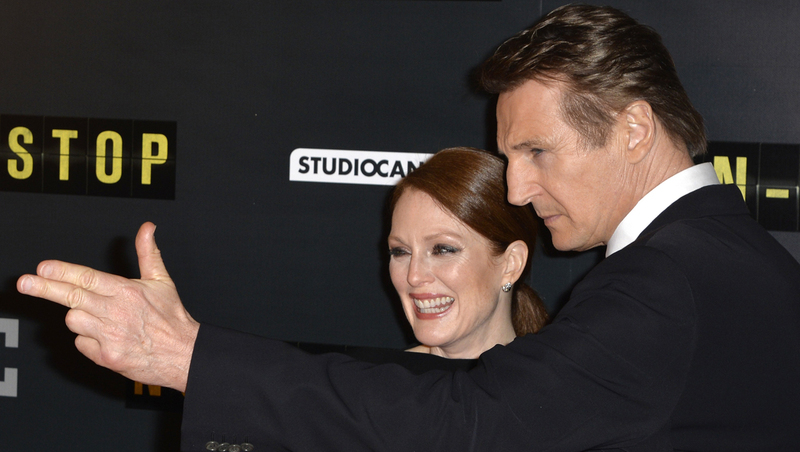 Liam Neeson and Julianne Moore are gearing up for a frightening "Non-Stop" flight. Neeson stars in the new action thriller as Bill Marks, a U.S. Air Marshall tasked with stopping a deadly terror plot unfolding on a flight from New York to London. Moore plays one of the flight's passengers. "Downton Abbey" star Michelle Dockery and "12 Years a Slave" best supporting actress Oscar nominee Lupita Nyong'o also star as flight attendants. Neeson describes "Non-Stop" as a fun movie, but he admitted to CBS News that he doesn't think a similar scenario could actually play out in today's times. "It can't happen," he said, "Not with security the way we have now, all over the world, at all airports. It can't happen." Watch the video at the top of this story to hear Moore offer up her take on Neeson's appeal with moviegoers. "Non-Stop" lands in theaters on Friday.